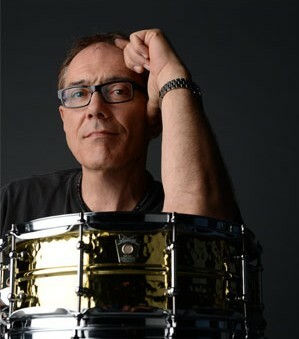 Here’s an interview with Vinnie Colaiuta by Modern Drummer. I’ve been researching articles on drummers, session work, and becoming an integrated musician because I’m being asked to play in the studio. It is proving to be a challenge. For one, it is exposing my lack of practicing and technique. It is also exposing my musical soul. I love to play and usually do it from the hip. I shoot from the hip a lot in life; whether it be music, pastoring, or recreation (i.e. “let’s go the movies” last minute). My hope is that “my-shooting-from-the-hip” is shaped and formed by all the stuff I’m pouring into myself-personal reflection, perspectives from others, disciplines of studying/practicing. So it’s a “hip-shot” but my hope is that it has some depth to it. One of my biggest passions in playing came from feeling like it was a transcendent experience. It felt like when I played, I was closer to God and Him to me. This is not about using or conjuring religious jargon. It was about space and time slowing down, and feeling like something special was happening. Beyond skill and talent, what are the keys to being a success in the music business? Other than skill and talent and the personality to maneuver through all of that, the rest of it is a blessing and you have to do it all to glorify God. If I say this to people, they’ll interpret it in a religious, dogmatic way. But I am talking spiritually. I’m not trying to represent myself as some bastion of spiritual goodness. It takes a level of humility and recognition of what your source is and who your source is. You have to recognize where the source came from and be grateful for it. That then filters into the personaltiy needed to maneuver in the music business. Just being genuine and true to yourself – those are all things that are immutable. Getting along with people and being as true as you can be to the music and to yourself is what it’s about. I avoid using certain words that will conjure up any kind of association of inferior versus superior. That’s why when I say “be the best you can be” I don’t use any connotation of what the word “best” means because I don’t want to suggest the idea of competition or some high skill level you have to achieve to be some gargantuan Olympian sports type. But if you can find another way to conceptualize that, you’ll understand what I’m thinking or trying to say.